After visiting the British Isles in 2013 and 2014, we wanted to stay within road-trip distance of home this year. In June and July of 2015, we took a long road trip through Baltimore, New York, New England, New Brunswick, and Quebec. We set out for Baltimore on the evening of Wednesday, June 24. Now, the direct route from Pittsburgh to Baltimore goes straight down the Pennsylvania Turnpike, and the Turnpike makes it much more convenient to eat at its service plazas than to get off the road. 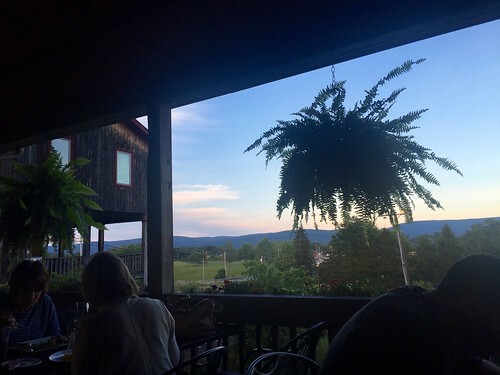 But I have my own superstitions, and one of my superstitions is that it’s important to start an eating vacation with an interesting meal – and the service plazas hardly count as interesting. So we got off the turnpike to eat at Out of the Fire, a place we’ve enjoyed before just minutes from the Donegal exit. 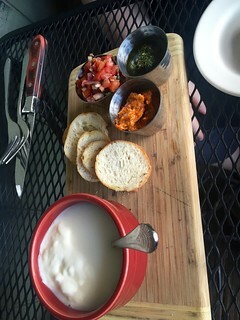 For an appetizer, we ordered the house-made fresh mozzarella with bruschetta. 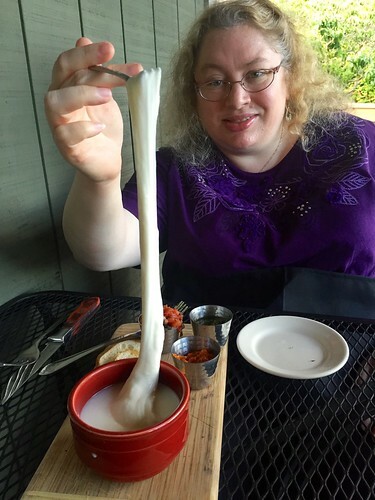 But once we overcame that, the mozzarella was very tasty, with a mild salty flavor and a very nice texture. 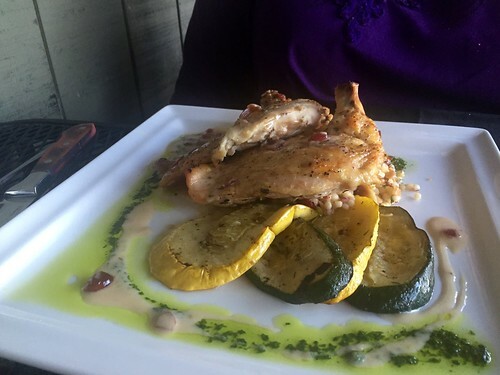 Lori had the smoked chicken breast and enjoyed it very much. I thought I tasted a touch of ash behind the smoke, but she did not. Instead of a full entree, I chose two appetizers. 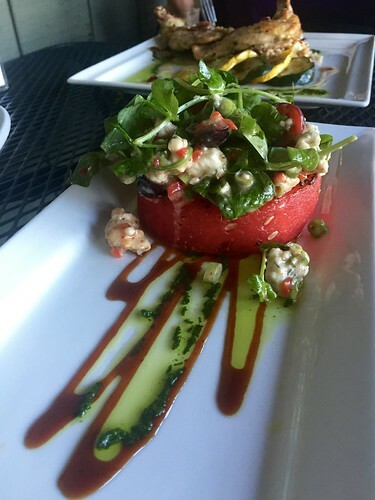 The first was an extraordinary grilled watermelon salad with cherries and blue cheese. The grilling made the watermelon super-sweet, but the sweetness was balanced very nicely by the funky tang of the blue cheese. 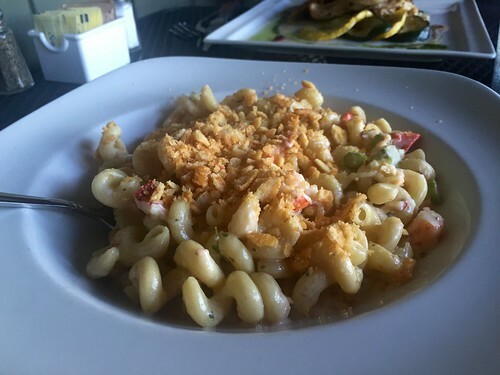 I had my doubts about ordering lobster mac and cheese so far from the water, but I ended up being glad. The lobster was very tender and flavorful, and it complemented the smoky gouda of the cheese sauce very nicely. 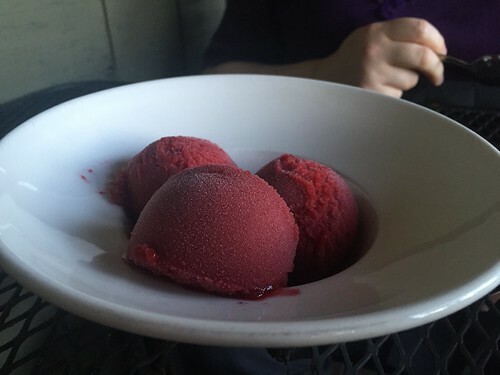 For dessert, Lori enticed me into the blackberry-cognac sorbet, which was a smooth, intense delight. We had entirely succeeded at starting our trip off on the right culinary foot. Our dinner had taken long enough that we saw a beautiful sunset in the rearview mirror as we set off again. We made it to our hotel in Baltimore near midnight.